El Al flight 1862 departed New York-JFK Airport for a cargo flight to Tel Aviv, Israel via Amsterdam, the Netherlands. The aircraft, a Boeing 747-258F, arrived at Amsterdam-Schiphol Airport at 14:40 hours local time for a crew change, cargo processing and refueling. The total amount of cargo was 114.7 tons, gross weight of the aircraft 338.3 tons which was 21 tons below the maximum allowable. The aircraft taxied out to runway 01L at 18:14 and started the takeoff roll at 18:21. At 18:28:30, as the aircraft was climbing through 6500 feet, the no. 3 engine and pylon separated from the wing in an outward and rearward movement, colliding with the no. 4 engine causing this engine and pylon to separate as well. An emergency was declared and the crew acknowledged their intention to return to Schiphol Airport and reported that they had a no. 3 engine failure and a loss of engine thrust of both no. 3 and 4 engine. At 18:28:57 the Amsterdam Radar controller informed the crew that runway 06 was in use with wind from 40 degrees at 21 knots. The crew however requested runway 27 for landing. A straight in approach to runway 27 was not possible because of airplane altitude (5000 feet) and distance to the runway (7 miles). The Amsterdam Arrival controller then instructed the crew to turn right heading 360 degrees and descend to 2000 feet. During this descending turn the flight crew reported that the no. 3 and 4 engine were out and that they were having flap problems. Final clearance was given to turn right heading 270 to intercept the final approach course. When it became apparent that the aircraft was going to overshoot the localizer, the controller informed the crew accordingly and directed them to turn to heading 290 to try and intercept the final approach path again. A further instruction was given for a 310 degree heading change and descent clearance for 1500 feet. These instructions were acknowledged and the crew added that they were experiencing control problems. While reducing speed in preparation for the final approach, control was lost and the aircraft crashed into an eleven-floor apartment building the Bijlmermeer suburb of Amsterdam. PROBABLE CAUSE: "The design and certification of the B747 pylon was found to be inadequate to provide the required level of safety. Furthermore the system to ensure structural integrity by inspection failed. This ultimately caused - probably initiated by fatigue in the inboard midspar fuse-pin - the no. 3 pylon and engine to separate from the wing in such a way that the no. 4 pylon and engine were torn off, part of the leading edge of the wing was damaged and the use of several systems was lost or limited. This subsequently left the flight crew with very limited control of the airplane. Because of the marginal controllability a safe landing became highly improbable, if not virtually impossible." This AD mandates replacement of all bottle bore fuse pins with new bulkhead style design fuse pins within 30 days. Redesign the B747 pylon structure including attachment to engine and wing. All SB\'s and AD\'s should be terminated after the redesign. Expand the training of pilots and ATC personnel to include the awareness that in the handling of emergency situations not only the safety of airplane/passengers but also the risk to third parties especially residential areas should be considered. Review design philosophy of fire warning systems, to preclude false warnings upon engine separation. Review flight control design to ensure that flight control surfaces do not contribute adversely to airplane control in case of loss of power to a control surface. Fire resistance of DFDR and CVR should be improved. Investigate the advantages of installation cameras for external inspection of the airplane from the flightdeck. The redesign program for the pylon should include a full scale fatigue and failsafe test. A large scale inflight fleet-wide fatigue load measurement program should be carried out, both on wing, fuselage, and fin mounted engines in order to establish more realistic load spectra for fatigue evaluations. 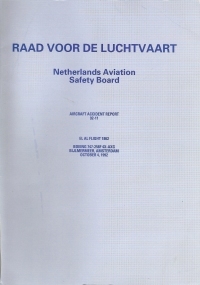 Review present methods of controlling structural integrity, such as non destructive inspection techniques and airworthiness directive requirements, in the current design B747 pylon assembly. If a structural design concept is used as the basis for the certification of another design, in-service safety problems for both designs should be cross-referenced. Evaluate and where necessary improve the training and knowledge of flight crews in cockpit resource management in order to prepare them for multiple systems failures, conflicting checklist requirements and other beyond abnormal situations. Expand the information on inflight emergencies in appropriate guidance material to include advice how to insure that pilots and air traffic controllers are aware of the importance to exchange information in case of inflight emergencies. The use of standard phraseology should be emphasized. Evaluate and where necessary develop common guidelines on emergency procedures and phraseology to be used between ATC, Fire Brigade, Airport Authorities and RCC. Distance from Amsterdam-Schiphol International Airport to Tel Aviv-Ben Gurion International Airport as the crow flies is 3288 km (2055 miles).